Deep Rivers bei DIREKTE VERGLEICH Online einkaufen. Arguedas, JosÃ© MarÃ­a. Deep Rivers. Translated by Frances Horning Barraclough. Introduced by John V. Murra. With an afterword by Mario Vargas Llosa. Austin, University of Texas Press, 1978. 24 cm. XV, 248 pages. Original Hardcover with original dustjacket in protective collector's mylar. Excellent condition first English language edition with only very minor signs of external wear. [Texas Pan American series]. JosÃ© MarÃ­a Arguedas Altamirano (18 January 1911 - 2 December 1969) was a Peruvian novelist, poet, and anthropologist. Arguedas was an author of Spanish descent, with a rare fluency in the native Quechua language, gained by living in two Quechua households from the age of 7 to 11 - first in the indigenous servant quarters of his step-mother's home, then escaping her perverse and cruel son, with an indigenous family approved by his father - who wrote novels, short stories, and poems in both Spanish and Quechua. 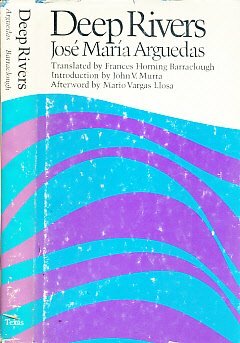 Deep Rivers (Spanish: Los rÃ­os profundos) is the third novel by Arguedas. It was published by Losada in Buenos Aires in 1958, received the Peruvian National Culture Award (Premio Nacional de Cultura) in 1959, and was a finalist in the William Faulkner Foundation Ibo-American award (1963). Since then, critical interest in the work of Arguedas has grown, and the book has been translated into several languages. According to critics, this novel marked the beginning of the current neo-indigenista movement, which presented, for the first time, a reading of indigenous issues from a closer perspective. Most critics agree that this novel is one of Arguedas' masterpieces. The title of the work ('Uku Mayu' in Quechua) alludes to the depth of the Andean rivers, which rise in the top of the Andes. It also relates to the solid and ancestral roots of Andean culture, which, according to Arguedas, are the true national identity of Peru.Generally remembered as one of the most notable figures of 20th-century Peruvian li..
Passt perfekt zu legeren Looks. Auffällige Nähte und das Web-Muster dominieren den Style. Cthulhu Lives! : An Eldritch Tribute to H. P.
Fruit of the Loom Herren Hose/Lang 14032B, Gr. Treat yourself today and lounge in comfort. Einfach zu bedienen, Ein-Knopf-Bedienung zum Einrichten. Geeignet für alle Arten von Haut, erwarten empfindliche Haut. Mini und tragbar, leicht zu absorbieren. Unser Model ist 186cm groÃŸ bei einem KÃ¶rpergewicht von 82kg und trÃ¤gt die GrÃ¶ÃŸe L.